Scholl Advance Athlete's Foot is clinically proven to treat Athlete's Foot effectively, whilst providing long lasting protection. For instant pain relief and advanced protection from blisters. Scholl Calluse Removal Pads provide immediate pain and pressure relief with a targeted medial action. Scholls Corn & Callous Removing Liquid quickly and effectively removes corns and callouses. Scholl Corn Foam Cushions reduce pressure and friction on corns or other painful areas and relieve pain immediately. Scholl Washproof Corn Removal Plasters have a medicated disc system which is clinically proven to target and remove corns. 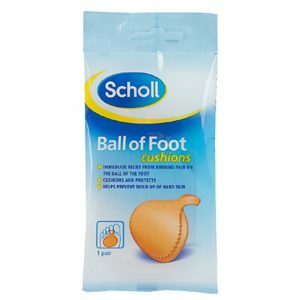 Scholl Corn Toae Gel Sleeve provides relief from pain and soreness of the toes.